*Offer expires May 31, 2019. Special conditions may apply. Commander in Cheat reviewed, Ed Travis rates the best new irons, Smokelahoma comes to OKC, Surf & Turf takes off and new Mezcals. Bass Pro Legends is back, Paradise Greens, Historic tournaments renewed, Danny Edwards and expert chipping, APT back in Muskogee, NAIA National Championship at Lincoln Park. New Oklahoma Golf Hall of Fame class revealed. Privately-owned public courses having rough go in Oklahoma. William McDonald, Taylor Towers head our rankings of Top 10 prep players for boys and girls. Will this be the year the Cowboys and Sooners meet in NCAA Championship? The Blessings is immaculate, beautiful and very hard. 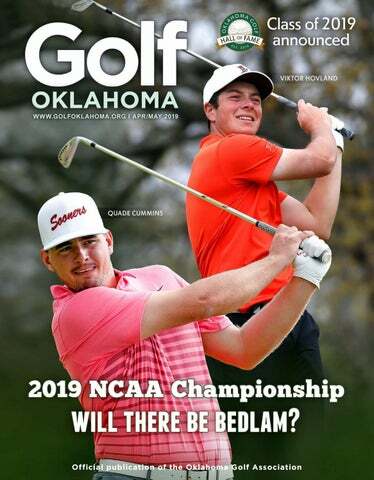 On the cover Oklahoma State’s Viktor Hovland and Oklahoma’s Quade Cummins, will they face off at The Blessings in the 2019 NCAA Championship? With award-winning dining experiences, a booming craft beer scene and exceptional year-round golf on courses along the Robert Trent Jones Golf Trail, plus Jerry Pateâ&#x20AC;&#x2122;s Kiva Dunes and Arnold Palmerâ&#x20AC;&#x2122;s Craft Farms in Gulf Shores, from the mountains to the coast, you can take it all in. Know your limits. Gambling problem? Call 800.522.4700. COO/Marketing Director A.G. Meyers agm@golfoklahoma.org Art & Technology Director Chris Swafford chris@golfoklahoma.org Subscriptions to Golf Oklahoma are $15 for one year (five issues) or $25 for two years (10 issues). 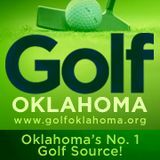 Call 918-280-0787 or go to www.golfoklahoma.org. Contributing photographers Rip Stell, Bill Powell Golf Oklahoma PGA Instructional Staff Jim Woodward Teaching Professional, Oak Tree National jwoodwardgolf@sbcglobal.net, 405-3482004 Jim Young Teaching Professional, River Oaks CC 405-630-8183 Pat McTigue Manager, GolfTec Tulsa pmctigue@golftec.com Tracy Phillips Director of Instruction, FlyingTee vt4u@yahoo.com, 918-352-1089 Maggie Roller Director of Instruction, Cedar Ridge CC maggie.roller@sbcglobal.net, 918-261-1441 Jerry Cozby PGA Professional jerrycozby@aol.com, 918-914-1784 Kyley Tetley, PGA Professional The Golf Studio 918-232-6564 Oklahoma Golf Association 2800 Coltrane Place, Suite 2 Edmond, OK 73034 405-848-0042 Executive Director Mark Felder mfelder@okgolf.org Director of Handicapping and Course Rating Jay Doudican jdoudican@okgolf.org Director of Junior Golf Morri Rose morose@okgolf.org Copyright 2018 by Golf Oklahoma Magazine. All rights reserved. Contents may not be reprinted or otherwise reproduced without written permission from Golf Oklahoma. Golf Oklahoma is published by South Central Golf, Inc.
Dills, David Edwards, Jeff McMillian, Brian Montgomery, brothers Craig and Chance Cozby, Talor Gooch, Hayden Wood, Austin Eckroat and Quade Cummins. Moore’s name is not on the list, although he reached the finals in 2010 only to lose to Ian Davis, who went on to an AllAmerica career at Oklahoma State before playing professional golf for five years. The OGA is very glad to have both Taylor and Bob Phelps to work with in 2019. Bob is a highly-respected rules official nationally and his expertise will benefit us tremendously. We have been blessed to lean on the volunteer efforts of great rules officials such as David Thompson, Gene Mortensen and Robert O. Smith, but now we will have that same level of expertise in-house. Shadow Valley GC, Rogers, Ark. were Alex Hack of Marlow, Faith Hopkins of Bartlesville, Emile Jackson of Edmond North, Joie Patterson of Chandler and Faith Stewart of Deer Creek. Go to www.woga.us to register online.. WOGA is excited about the 2019 season and the great venues for events. The highlight will be the 101st State Amateur Championship scheduled July 22-25 at Oak Tree Country Club on the East Course. The WOGA Stroke Play Championship will be held June 10-11 at Hillcrest Country Club in Bartlesville. Other events include the Stableford Partnership on April 29-30 at Lincoln Park and our Senior Championship will be May 20-21 at The Trails Golf Club. WOGA’s 69th Girls Junior State Championship is June 18-19 at Quail Creek. The age requirement has changed to include girls who will not have reached their 19th birthday on or before June 17, 2019. The annual WOGA Partnership will return to Shangri-La Resort on Aug. 19-20, and the season will conclude with the annual WOGA Cup on Sept.30-Oct.1 at Oakwood Country Club in Enid. For information about these tournaments, or the WOGA Junior Fundraiser Tournament, please visit our website at www. woga.us or call 918-760-4255.
opportunity to leave the flagstick in at Hawaii and the general feeling was disbelief at how much it helped. It would be great to shave four of five strokes off your score and save time while doing so. Rule 17 pertains to “Penalty Areas.” The new term essentially covers what was called water hazards, but since the Penalty Area can include other spaces, the word “hazard” became obsolete. With the authority to include other spaces, such as extreme rough, they can mark such areas so that a player need not return to the spot of the previous shot for a lost ball, he will simply take relief where the ball crossed the margin into the Penalty Area. In this same respect, the Committee can adopt a Local Rule which provides relief for the player who does not play a provisional ball and then finds his original ball out of bounds or lost. Using this procedure, the player can create a forward relief area and does not have to return to the spot of the previous shot under stroke-and-distance. It will take some time for us to become familiar with the revised Rules. For help, go to the new rules guide at www.okgolf.org. in a rule that has been around perhaps from the original rules. Play the ball as it lies. I found an interesting interpretation. “Take responsibility for your own actions or face the adversity.” While I hesitate to compare golf to other sports, what if the running back said that he didn’t intend to step out of bounds, so that touchdown should count because he didn’t mean to step out? Ludicrous? I think so. The Rules of Golf are a consolidated work of the USGA and The R&A. Those bodies are held responsible for preserving the integrity of the game of golf. Until all players, amateurs and professionals fully understand that responsibility versus making the game something different, a division will likely continue. Call 918.357.3332 FOR BULK PRICING OR TO ORDER. kins is one of three writers (with Bernard of two of his best-selling football novels, Darwin and Herbert Warren Wind) in the “Semi-Tough” and “Life Its Ownself.” But in terms of golf writing, Jenkins had Golf Hall of Fame, and as he said at his infew peers, especially duction, the only one to when it came to covarrive vertically. ering, and attending Jenkins shows up majors. I met him at in another epigraph in the 2009 U.S. Open in Reilly’s book, and the Bethpage. Jenkins had former was clearly a taken to social media model and a mentor to by that point, and was the latter, as he was to churning out mostly himany other writers in larious tweets, often, it the wake he churned. seemed, at the expense As Reilly tweeted afof Sergio Garcia. Who ter the news emerged surely deserved it. that Jenkins had passed The final tally — 68 away at age 90: “So Masters, 63 U.S. Opens, long to the great Dan 45 Open ChampionJenkins, the funniest ships and 56 PGA sumbitch to ever call Dan Jenkins Championships — 232 hisself a sportswriter. majors in all, to save you the addition. And There’ll never be another.” Jenkins was a Trump supporter, but I a lot of fine words about the dogged vichave the feeling he would have, at least, re- tims of inexorable fate. spected Reilly’s effort. I reviewed only one Except when forced to take a mulligan or pick Jenkins book in these pages, “His Ownself: A Semi-Memoir” (in the April-May 2014 is- up a gimme, Tom Bedell plays the game with rigsue), the title of which was a play on words orous honesty. The expressions in the Del Maguey, Vino de Mezcal Series are hand selected by Founder, Ron Cooper to represent a slice of deep culture in very limited quantities. obscure product is now on back bars all over Oklahoma, and single-village batches are typically less than 1,000 bottles and can sell for well over $100 a bottle. Mezcalero will likely run $95 to $115 a bottle, depending on the store. All tequila is mezcal, but not all mezcal is tequila. Mezcal is a spirit distilled from maguey, a family of succulents that includes blue agave, the most widely cultivated maguey in Mexico and the source of tequila. Other members of the family have been distilled in small villages for centuries to make mezcal. Proudly serving Oklahoma with a fine selection of cigars and related products. Stop on by our current locations and share a smoke with us! his has been called the year of ball speed. In 2019, every club manufacturer is talking about driver designs that give average players more ball speed, which of course, when matched with the right trajectory and the right spin is another way of saying more distance. However, drivers are not the only clubs benefiting from high-tech improvements. Irons also have and especially irons meant for play by average golfers. Golf Oklahoma thought it would be valuable to look at some of the latest models in three iron categories in case new irons are on your to-do list. Most of us should start our evaluating with game-improvement models since these tend to work the best for the greatest number of players. Mixed sets have become popular with, for example, a game-improvement model in the lower lofts and players-category in the higher lofts. Here are iron models we like in the three more “golfer-friendly” categories. Players-Distance Irons This relatively recent way to categorize irons is in response to those with lower handicaps who want and need some help getting more distance plus added forgiveness but who are not ready to move over to game-improvement irons. They have thin toplines and at address look very like players-category irons. Narrow soles minimize turf contact and thinner faces are often a cup face design. Some have a hollow-head construction with foam inside and others a medium-size cavity back. Callaway Apex 19: Good-looking platinum chrome finish on this forged 1025 carbon steel body with progressive shaping. Inside are urethane microspheres encasing tungsten weighting for forgiveness and feel. Callaway’s proven cup face in long and mid irons with variable thickness forged face in scoring lofts. PW loft 43°. 5-iron through PW $1,050 (steel). Mizuno JPX 919: Forged Body is forged from a single high strength 1025 boron steel billet. Face is CNC milled from sole upward to lower center of gravity. Frame is open at heel for better launch, head stability at impact and high ball flight. Chrome plating brushed to a pearl finish. PW loft 46°. 4-iron through GW $1,300 (steel). PING i500: Forged steel variable thickness face in a classic muscle-back shape head with moisture shedding Hydropearl 2.0 finish. Blade-like look at address but constructed like a metal wood for high ball flight and distance. Sculpted hosel to save weight. Heel and toe perimeter weighting. PW loft 45°. 4-iron through PW $1,137 (steel). TaylorMade P790: Shallow face with progressive offset. Resilient foam injected into 4140 carbon steel forged head to give soft feel. Thin 1.77mm wrapped face with Inverted Cone interior has slot in sole to improve flex. MIM (metal-injection-molded) tungsten weighting. PW loft 45°. 4-iron through PW $1,138 (steel). 85 YEARS OF COMBINED EXPERIENCE. ONE PIECE OF ADVICE. GET CUSTOM-FIT CLUBS FROM CLUB CHAMPION The world’s most renowned swing coaches are quick to tell you that proper technique can only take you so far. You also need clubs custom fitted to your swing. Club Champion is America’s premier club fitter offering 35,000 hittable club component options. They have the most highly trained fitters and builders to create clubs that help you hit the ball farther and lower your scores. has developed that formula and will give you Edwards said. “I taught it to a coach of a golf the basics of stance, grip, setup and the for- team recently and he and all of his players have fallen in love with the sysmula for how far to land each tem. It just gives them a system shot depending on total distance and a formula where they can to the green and the hole. He chip balls right up beside the demonstrated it to golfers at the hole.” Oklahoma Golf Expo and is sellEdwards was the 1969 Oklaing the secrets in his new video, homa high school golf champion “The Chipping Equation,” availat Edmond, and a three-time Allable at www.dannyedwardsgolf. American at Oklahoma State. He com. was a member of the 1973 U.S Edwards, who lives in Arizo.Walker Cup team. This is not na, said for almost all chips one his first venture into the business of two different clubs will work Danny Edwards side of golf, having previously and neither of them are a lob teaches you how to founded Royal Grip and Greenswedge. hit chip shots efFix Golf Inc. “It works because it’s physics,” ficiently in video. entertainment. Golfers will be flighted according to handicap with added money for those declaring for Championship Flight. A horse race and skins game also are part of the festivities. For more information or to enter, call McAlester Country Club head professional Kelly Byrd at 918-423-3599. Chickasaw Pointe GC in Kingston. Rounds 4 Research The Environmental Institute for Golf, the research arm of the Golf Course Superintendent’s Association will be conducting its annual Rounds 4 Research course auction to benefit research, advocacy and education, and golfers are the beneficiaries. Beginning April 29, golfers can go to www.biddingforgood.com/rounds4research for the chance to bid on donated rounds from Oklahoma and throughout the country. The auction ends on May 5. The courses that have been donated are on the website so golfers can see them in advance and plan their bids. 2019 Golf Pass is BIGGER AND BETTER! Visit scspgagolfpass.com to order yours today! Equipment, cont. from page 20 with a high speed/ high rebound TPE inside the slightly longer clubhead help give added ball speed. Seven tungsten weights across the back. Easy to hit and forgiving with high resistance to twisting. Custom fit only. PW loft 44°. 5-iron through PW $3,000 (steel). TaylorMade M6: Unique strap from sole to topline allows more face flex and reduces body distortion for less energy loss and more ball speed. Dampener in cavity absorbs vibration. Fluted hosel with undercut cavity raises launch angle and helps impact low on the face. Face interior TMaG’s Inverted Cone. PW loft 43.5°. 5-iron through AW $875 (steel). lightweight shafts to promote faster swings. glare. PW loft 43°. 5-iron through PW $975 Some have hybrid-like heads and mixed sets (graphite). Cleveland Launcher HB: Long irons are often offered. built like hybrids and conventional deBridgestone Tour B JGR HF1: sign short irons. Lightweight Forged heads with slit near base crown pushes center of of variable thickness face gravity low and deep allows more deformaand increasing stabiltion at impact raising ity at impact. Steel trajectory and ball face is very thin speed. Hollow cavwith added flex ity design for disand weight saved tance with easy moved to perimlaunch. Extremeeter. Progressive ly low center of shaping and offgravity. 5-iron set through set. through attack PW loft 44°. 4-iron wedge sold sepathrough PW $800 rately. PW2 loft (graphite). 44°. 6-iron through Wilson Staff D7: PW2 $850 (graphite). Callaway Big Bertha Plastic-filled holes in the Callaway Big BerThree-piece sole, three rows in long iron tha Three-piece: Core with to one row in short irons, allows tungsten weight surrounded by urethane microspheres places clubhead the hot and responsive face flex at impact weight low. Easy launch with high trajecto- for more distance. Cleaner look at address ry. Callaway’s thinnest cup face design has a than previous models. Shafts are ultraflexible rim giving additional flex to produce light at only 65 grams. PW loft 43°. 5-iron more ball speed. Smoked PVD finish reduces through GW $700 (graphite). ball match between the teams of Jack Nicklaus and Gary Player, Lee Trevino and David Graham and Ben Crenshaw and Jerry Pate. A fourth team consisting of two celebrities will be named as well. If interested in the VIP tickets, call tournament director Kirk Elmquist at 417-988-4235. For regular tickets, which are $25 or $20 if purchased with a Mastercard, call 888-347-4426 or go to www. basssprolegends.com. Tickets are also available at the gate. The Ozarks National Course will open to the public following the tournament. From a simple backyard green to this extravaganza, Paradise Greens is ready to help. and gas business together while his two brothers have experience in construction and landscaping. His father actually was the first to attend a Celebrity Greens conference after hearing the ads on the PGA Tour channel on XM Radio. They have now installed greens in Tulsa and Oklahoma City and have access to experienced Celebrity Greens designer Weston Weber when needed. For more information on Paradise Greens, go to www.paradiseturf.us or call 405-510-0178. Rising teaching star Ryan Rody, whose students include Quade Cummins of Oklahoma and Austin Eckroat of Oklahoma State along with dozens of other top junior and collegiate players, is the new director of instruction at Southern Hills Country Club. Rody was previously the director of golf and instruction at Gaillardia Golf Club in Oklahoma City. He will operate out of the new indoor teaching facility that is part of Southern Hills’ extensive renovation. “One of the things that was so attractive about him was the ability to teach all types and skill levels of players,” Cozby said. “He’s taught the every day player right up to Will Kropp on the Web.com Ryan Rody works Tour.” with Drive, Chip and Rody worked at Madison Club Putt finalist Evyn in LaQuinta, Calif., and Spanish Cannon of Edmond. Oaks in Austin, Texas, before settling in at age 25 for a five-year run as an assistant teaching professional at Brook Hollow Golf Club in Dallas. At Brook Hollow, he worked alongside and learned from Cameron McCormick, instructor to Jordan Spieth. to do so. Max McGreevy of Edmond, who two years ago led Oklahoma to the 2017 national championship, is playing APT events this year after having failed to keep his Web.com Tour card. He started the year by finishing in second place at the Coke Dr. Pepper Open at OakWing CC in Alexandria, La., at 24-under par. Other Oklahomans on the APT in 2019 include former University of Tulsa player Logan McCracken, former OSU golfer Sam Stevens, former OU golfer Grant Hirschman (tied for second in the season’s second event), former OSU golfer Trent Whitekiller of Sallisaw, former TU golfer Matt Mabrey and others. Admission to The Real Okie Classic is free. Practice rounds are on Monday, followed by a pro-am Tuesday morning and a free clinic for young players at 4 p.m. Monday afternoon. The 72-hole tournament gets under way Tuesday morning. A field of 130 players will compete for a purse of $135,000. Last year Daniel Miernicki won $20,000 for first place. For more information on the event or the pro-am, go to www.visitmuskogee. com. rector of OCU golf after men’s coach Kyle Blaser stepped down in JanuThe Stars will take aim at the NAIA national championship at Lincoln ary, hasn’t lost Park. Back row: Natalie Gough, McKenzie McCoy, Regan McQuaid, faith that a Arianna Medina, Clair Hill. Front row: Lauren Behnken, Loren Malate surge and trone, Melissa Eldredge, Lauryn Pritchard and Rachel Eckert. home course advantage could put his team in the title pains and found our own identity.” OCU will be one of 29 or 30 teams and hunt. “This team has a lot of talent,” McCauley approximately 10 individuals who will said. “I’m not sure quite why we’ve under- comprise the field of 156. All conference achieved, but we need to get some pep in champions are invited as well as eight atour step. I’ve never had a team this young large invites based off NAIA rankings. and I’ve never had a team this close to each Practice rounds will be May 12-13. The field will be cut to the low 16 teams other. I’m hopeful by the end of this spring we’ll have worked through the growing and individuals in the top 40 after 36 holes. tending institutions of higher education. Students must have an active interest in golf and may not be previous recipients. The specifics of the criteria and the application form for the Hall of Fame scholarships are both available at www. oklahomagolfhof.org. Deadline for entry is May 1, 2019. Entries must be mailed to Oklahoma Golf Hall of Fame, 6218 S. Lewis Ave., Suite 200, Tulsa, OK, 74136, or emailed to ken@golfoklahoma.org. *Seniors must be 55 & older. **Available for non-Seniors ONLY. Card program subject to change without notice. Visit the website for rates, twilight times and complete program details. Expires 12.31.2019. 12.31.2018. Members will be able to keep fit inside and out at the Ridge Club. restaurant and have the staff and personnel to do it.” Robson said his mother and grandmother were great cooks. “Everything revolved around food. That was the hub of our social life,” Robson said. “We’re going to include a lot of our old family recipes but often with a twist.” In addition, the menu will feature a variety of items, including hand-cut steaks, salads, and monthly specials. The restaurant will continue to serve breakfast and lunch daily and dinner on Wednesday through Saturday evenings. around the world wishing to experience golf “on top of the world.” Oklahoma’s mean elevation is 1,300 feet where Colorado’s mean altitude is 6,800 feet - the highest in the nation. The state boasts more than 1,000 peaks over 10,000 feet with 54 towering above 14,000. What does this mean for your golf game? Well, that can depend on weather conditions, but the general rule is that the difference between playing golf in Oklahoma and the higher-elevation courses of Colorado is that a ball can carry 10-20 percent farther due to the thinner atmosphere in Colorado. You will have to master the management of your distance and trajectory of your ball. Also, you will need to prepare yourself for the thinner atmosphere as overexerting, especially on the first days, can cause fatigue. I am not saying give up your beer or caffeinated beverage, but certainly, drink more water and acclimatize yourself at least a day in advance as you are in for a memorable golf experience. There are numerous courses in the area, but four that should definitely be played: Granby Ranch Golf Club was an excellent way to start our four days of “elevated” golf. At 8,100 feet, this course is consistently ranked as one of the state’s most beautiful public courses. It was the Nicklaus Design Group who reworked the rolling landscape into what Golf Advisor rated as the 10th-best course in Colorado. With the Fraser River running through the property and the majestic Rocky Mountains seeable on every hole, this 7,190-yard layout provides a variety of tee boxes and excellent value as Blue Grass fairways and Bent grass greens are perfectly groomed. Pole Creek, spectacular at 8,600 feet. stunning and award winning, The Golf Club at Redlands Mesa, considered by Golfweek as the “No. 1 Golf Course You Can Play in Colorado.” The course is dramatic as red rock formations provide extreme contrast to the stunning green of meandering fairways. With a slope of 135, there is plenty of trouble, desert sands, rocky crags and strategic water hazards. At 4,600 feet above sea level, our length was not as it had been 4,000 feet above, causing some consternation attempting to avoid putting a ball into a hazard. You should definitely bring your camera to this course. As our weeklong adventure came to an end, we decided to visit Grand Junction’s municipal course, Tiara Rado. This Audubon Cooperative Sanctuary course is home to a variety of wildlife. Casual and friendly and at only 4,500 feet, we actually felt invigorated walking the course. when she turned professional, this year least earn an opportunity to compete in a regional. TU needs continued depicked up strength as three golfers became velopment from its young eligible. A very young squad had quite squad of freshmen the learning experience in the fall Shaelee Scarberry, and but with Lianna Bailey of LeicesSammy Liu along ter, England, Han-Husan Yu of with sophomore Taiwan and Sara Camarena Taylor Dobson and of Mexico City gaining their senior Johana Sameligibility at semester break, uelsson. the Cowgirls won in a spring Tseng has won an break trip to Hawaii and event and finished in have some hope of making the top five in five of the 30-team field after the diseight tournaments. appointment of missing by a shot Oral Roberts is an unlikethe chance to compete on their home course Karsten Creek in 2018. Kaitlyn Milligan ly participant in regional play but has found a rising The University of Tulsa found a star in freshman Lorena Tseng and could at star in freshman Sarah Bell. Quade Cummins during the first round of The Goodwin at the Stanford Golf Course in Stanford, Calif.
thing before anyone else did.” mitted to the Sooners following his sophoAfter making a recruiting trip to OU, more year in high school. y his own choice, Quade CumBecause Cummins competed inside the mins opted to compete only in Cummins promptly cancelled his planned Oklahoma as a junior golfer. He visit to Oklahoma State and orally com- state only, there was an unknown variable didn’t venture outside state lines until he finished high school. “I just didn’t really want to, honestly,” Cummins said. “I felt comfortable in Oklahoma. I didn’t really want to leave.” Cummins certainly excelled inside his comfort zone, becoming a two-time Class 4A state medalist at Weatherford High School with individual titles in 2013 and ‘15 and a two-time regional champion in ‘14 and ‘15. He also was the 2011 OGA Junior Boys champion and claimed the 2016 OGA State Amateur Championship. Oklahoma coach Ryan Hybl wasn’t about to let one of the state’s finest escape elsewhere. “Coach Hybl started watching me first,” Cummins said. “He obviously saw some- Cummins and teammates celebrate the 2018 Big 12 Championship at Southern Hills. Austin Eckroat enjoys the competition among his Cowboy teammates. Eckroat, Hovland and Wolff. “I really believe this year’s team is better and that every player has gotten better,” said Eckroat, who proudly lifted the NCAA championship trophy at Gallagher-Iba Arena when the title banner was displayed in early March. Besides becoming the first OSU team to repeat as national champions, Eckroat wants to earn a spot on the U.S. Walker Cup team this summer. He is likely the only one of the five OSU starters that will be back in 201920, as Wood and Bauchou are seniors and Hovland and Wolff are projected to turn professional, although no firm announcement has been made. Team leader is a role Cowboy coach Alan Bratton expects Eckroat to assume with no problems. “He’s on a solid improvement trajectory and I hope he takes over this year,” Bratton said. “He’s growing into that role nicely. He’s a good driver of the ball and his swagger or belief in himself is a big part of who he is. He’s a very solid middle and short putt putter and thrives in the moment. You put him on a big stage and he takes off.” There will be plenty of those coming up shortly. The Blessings, equally beautiful and demanding. State college talent abundant though he’s been a mainstay in the SNU lineup since arriving on campus. As a junior, he had five finishes in the top eight or better, and ended his season tied for 28th at his regional. Cody Burrows, Oral Roberts The senior from Chickasha has been a three-time All-Summit League honoree, including being named the SL’s Golfer of the Year as a sophomore. He has been ORU’s stroke average leader in each of those three seasons as well. He had three top-seven finishes in the fall. MEN Rhett Bechtel, Southern Nazarene Kason Cook, Southwestern Having come from tiny Hydro, just A product of Edmond North, Bechtel earned his first college victory a few miles east of the Southwestern at the Houston Classic in February, campus, Cook was a small-school star Oklahoma and Oklahoma State golfers get plenty of attention — in some cases, on a national level — but they’re not the only talented college players in the state. Setting aside the state’s Big 12 programs, let’s take a look at 10 college golfers at other Oklahoma schools, five men and five women, who have proven themselves worthy of recognition. This list could easily be twice as long. Blake Murray the top seven only once in five events. Lorena Tseng, Tulsa The Taiwanese freshman exploded onto the scene with top-10 finishes in her first four college tournaments. That included a victory at the Las Vegas Collegiate Showdown with a 13-under-par 203, the best 54-hole individual total in school history. She posted a stroke average of 71.3 over 15 rounds in the fall and has started her first spring season equally strong. Jess Whitting, Rogers State The Australian made RSU women’s golf history last year as a freshman when she was named an All-American by the WGCA, becoming the first player in the young program to receive that honor. A native of Perth, Whitting picked up two victories in her freshman season, to go with six more top-five finishes. She has a pair of top-10s this spring. Nothing wrong with unique golf swings Over the years golf pundits have lamented the death of the unique or idiosyncratic. In the 1970’s they said that all of the tour pros looked alike, had the same Jim Young haircut and color, had the same “Reverse C” finish to their swings, and wore the same color bell-bottoms. In the late ’80’s or early ‘90’s, they said that everyone’s golf swing was starting to look the same, the product of what they called homogenized instruction (an argument that continues today by the way). For the last few decades a large contingent of the golf establishment has contended that modern equipment somehow removes the artistry and uniqueness from the game. I would contend that all of these arguments are false and that the golf instruction community with the science behind it are now in a position to explain why. Book your special events now! 5501 S. Yale Ave., Tulsa, Okla.
Hills CC, Ardmore July 15: U.S. Amateur, The Territory, Duncan July 25: Senior Amateur, Hillcrest CC, Bartlesville Aug. 12: Men’s and Women’s Mid-Amateur, Oak Tree National, Edmond Sept. 29: Women’s Four-Ball Amateur, Tulsa CC, Tulsa OKLAHOMA SENIOR GOLF ASSOCIATION May 6-7: Spring Medal Play, Shawnee CC, Shawnee July 15-16: Four-Ball, Oakwood CC, Enid Sept. 16-17: Fall Medal Play, Bailey Ranch GC, Owasso Oct. 21-22: Fall Outing, Dornick Hills G&CC, Ardmore OKLAHOMA JUNIOR GOLF TOUR March 2-3: John Conrad Spring Challenge, Midwest City March 18-19: Muskogee Spring Break Classic April 6-7: Lake Hefner South Spring Classic, Okla. City April 13-14: Bailey Ranch Spring Challenge, Owasso May 26-27: Oklahoma Jr. Cup, Shawnee CC May 29-30: Oklahoma Junior Cup Matches, Shawnee CC, Shawnee July 16-17: Kickoff Classic, Lincoln Park GC (East), Okla. City July 27-28: South Lakes Junior Shootout, Jenks Aug. 3-4: Bailey Ranch Bash, Owasso Aug. 10-11: Forest Ridge Fall Challenge, Broken Arrow Aug. 17-18: Jo’s Famous Pizza Kickingbird Fall Challenge, Edmond Sept. 1-2: Battle of Broken Arrow, Indian Springs GC, Broken Arrow Sept. 14-15: Lake Hefner Shootout, Okla. City Sept. 21-22: Lincoln Park Best of the West Classic, Okla. City Sept. 28-29: Muskogee Fall Classic Oct. 5-6: Tour Championship, Shawnee CC Oct. 19-20: OJGT/TJGT Red River Challenge, Dornick Hills G&CC, Ardmore AJGA Aug. 5-8: Gateway Mortgage Group Tulsa Junior, Oaks CC, Tulsa Oct. 11-14: The PING Invitational, Karsten Creek GC, Stillwater TULSA GOLF ASSOCIATION April 6-7: Two-Man Challenge, South Lakes GC April 25: Three-Man Team Best Ball Shamble Net, Tulsa CC May 4-5: Four-Ball Stroke Play and Seniors, Forest Ridge GC May 7-8: Senior Stroke Play, LaFortune Park GC May 14: Three-Man Team Best Ball Shamble Net and Individual Stroke Play, Oaks CC June 13: Three-Man Team Best Ball Shamble Net and Individual Stroke Play, Forest Ridge GC June 22-23: Stroke Play and Seniors, LaFortune Park GC July 13-14: Two-Man Challenge II (Scramble/ Modified Alternate Shot), South Lakes GC Sept. 6: Par-3 Member/Guest or Member/Member, LaFortune Park Par-3 GC SOUTH CENTRAL PGA EVENTS April 22-23: Oakley Assistant Match Play, Terradyne CC, Andover, Kan. June 17: Web.com Monday Qualifier, Willbowbend GC, Wichita July 8-9: SCPGA Pro Championship, Patriot GC, Owasso July 15-16: Wildhorse Canyon Farms Senior Match Play, Fayetteville CC, Fayetteville, Ark. July 22-24: Yamaha Match Play, Dornick Hills G&CC, Ardmore July 29-30: SCPGA Sr. PGA Pro Championship and Yamaha Senior Section, Shangri-La Aug. 5: National Car Rental Assistant, Forest Ridge GC, Broken Arrow Aug. 12: Section Championship, Rolling Hills CC, Wichita July 31: Senior Cup Matches, Auburn Hills, Wichita Sept. 3: Justice Pro-Assistant, Oak Tree CC, Edmond Sept. 9-10: Justice Sr. HOF, Jimmie Austin GC, Norman Oct. 9: TaylorMade Players, Flint Hills National GC, Andover, Kan.
*With approved credit. Not everyone will qualify. Get engine, transmission and other powertrain protection for as long as you own your vehicle at no additional cost.